The various factors that contribute to making errors. The importance of considering the overall objectives of the company when evaluating processes. How focusing on process changes that make it easier for workers to be accurate can have a significant positive impact on inventory accuracy. Various techniques for improving the human-machine interface. How directed tasks and transaction-by-exception techniques can increase accuracy. The importance of procedures, and what should and should not be included in them. The importance of employee training and how technology can increase the effectiveness of training. The value of process checks and under what circumstances they should be applied. The importance of accountability and methods for communicating and monitoring performance. The benefits of cycle counting. The characteristics of a standard cycle count program. Why a standard cycle program may not be the best method for your operation. Alternatives to the standard cycle count program. How to implement and run a cycle count program. How to evaluate cycle count variances. The pros and cons of blind counts. How counting your inventory sometimes does more harm than good. How to conduct a physical inventory. A better method for conducting tag counts. How to avoid the annual physical inventory. Various methods for measuring accuracy and how to calculate them. Why accuracy measurement is often misleading. How to conduct an accuracy audit. How exception reporting can help to identify errors and monitor processes. How to prevent "lost" inventory from creating problems with planning systems. How to properly utilize counting scales. The benefits of using bar codes. The basics of bar code printing technology. How a programmable bar code scanner using a keyboard-wedge interface can provide a low-cost means of incorporating automated data capture (ADC) into your operation. The pros and cons of hand-held portable computers. The benefits of wearable systems. How speech-based technology (voice-directed, speech recognition) can increase accuracy. How light-directed systems (pick-to-light, put-to-light) can increase accuracy and where they are best applied. What is RFID and how it can be utilized. How to control the costs associated with implementing accuracy-related technologies. What a locator system is and why you probably should be using one. How a warehouse management system (WMS) can increase accuracy. How to best utilize technology to accomplish business objectives. Specific tips on receiving, putaway, returns, order picking, and shipping processes. How to deal with negative inventory balances. Problems associated with multi-plant processing and how to avoid them. 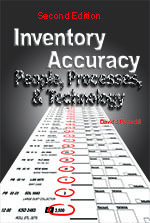 How to maintain accuracy when outsourcing manufacturing or distribution operations. How to maintain accuracy and cycle count in a 24/7 environment. How theft occurs and methods to reduce exposure. What WIP (work-in-process) really is and how to maintain accuracy with it.